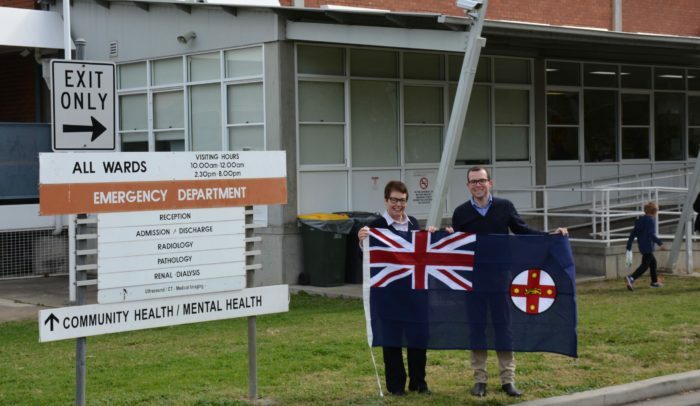 A BRAND new NSW State flag will now be flying proudly out the front of Moree District Hospital after Northern Tablelands MP made a presentation to Moree Health Services Manager Bronwyn Cosh today. The new flag will hang long side the Australian and Aboriginal flags and replace its old and faded predecessor. Mr Marshall also discussed his continued push for the redevelopment of the Moree Hospital with Mrs Cosh. “With Armidale’s $60 million redevelopment almost complete, Inverell’s $30 million rebuild about to start, I’ve no got Moree Hospital in my sights for a major overhaul,” Mr Marshall said. “I’ve already begun the lobbying process within government and am now hoping Hunter New England Health will prioritise the hospital on its capital works list so we can start some early scoping work to get an idea of the extend of the project and a rough idea of the total cost. Mr Marshall said the existing renal dialysis unit, which was the result of enormous fundraising in the community, was stretched and beyond capacity. “There are many other components of the hospital which are outdated, too small and simply not appropriate for modern healthcare,” he said.